The Becci of Ladram is a commercial fishing vessel that’s moored in Exmouth Marina. Skippered by Tony Wreford, the Becci of Ladram is a 10-metre Potter and Netter, which is fully licensed by the Marine Management Organisation to catch shellfish and prime fish, and fishes according to Devon & Severn Inshore Fisheries and Conservation Authority regulations. As you might expect, Skipper Tony is something of an expert when it comes to fishing these waters – he’s been working in Lyme Bay for fifty years, and knows exactly where (and, importantly, when) to look for the best crabs, lobsters, cuttlefish and whelks..
Tony and his crew use pots for crab, lobster and whelk fishing; each rigid, netting-covered pot is baited and laid in the water, where the animals are attracted to the bait and enter the pot through an opening in the netting. The opening is positioned in such a way that, once inside, the animal cannot easily escape, but specially-designed escape hatches ensure that smaller-sized animals go free. The animals that are hauled in to the boat are each measured individually, and any that are smaller than the legally-approved size are put back into the sea alive. Tony’s practised eye and years of experience mean he knows exactly what to look for – for example, the colour of a Lyme Bay crab will indicate how good it’ll be to eat; the darker yellow its shell is, the better. Fishing with pots in this way helps to limit damage to the ocean habitat, especially as the pots do not damage the sea floor, and – thanks to the skill and care of Tony and his crew – it also helps to ensure that the crabs and lobsters brought aboard the Becci are of superb quality. 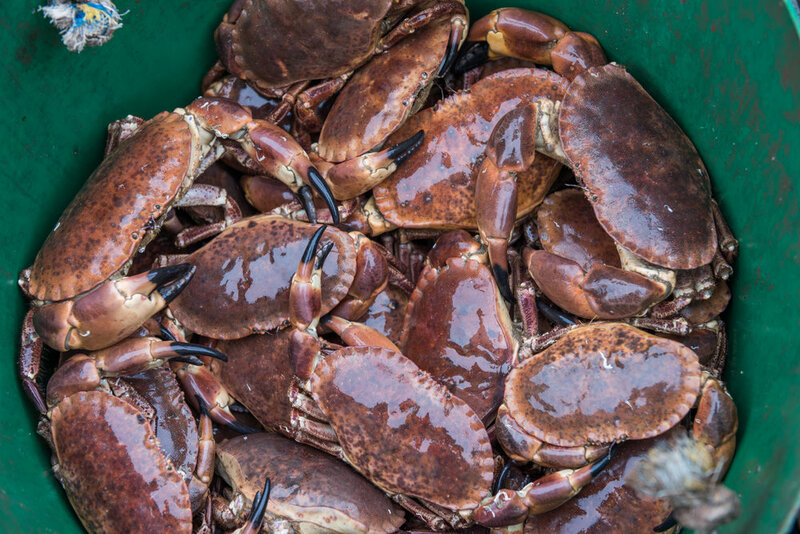 When the catch is landed at Exmouth docks, it has a short journey to the tanks at Greendale Farm Shop, where customers can choose a live crab or lobster fresh from the waters of Lyme Bay.